Posted on March 14, 2018 at 5:37 am. Although there is no testing scheduled for today, 8th graders should still remain in their TA this morning — as there is NO 8th grade Wolf Time today. Then, testing resumes TOMORROW for the 8th grade Hokies and Patriots teams. Students are reminded to FULLY CHARGE your iPads overnight, and check with your TA teacher for room assignments or with any other questions. The library will be OPEN today for students to check out and return books. Again, with the break in the testing schedule, the library will be OPEN. What do the “The Maze Runner,” “Land of Stories”, and “The Red Pyramid” all have in common? They dominated their opponents during the first week of our WMS Tournament of Books! 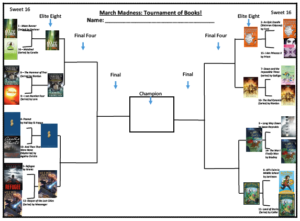 That’s right, The March Madness Tournament of Books has reached the Elite-Eight! So check out the new matchups and make your picks using the QR code by the cafeteria, or follow the link in today’s Morning Announcements Blog. There’s a lot of great books out there, but only ONE can be the CHAMPION! Vote TODAY in the Tournament of Books!! Jump aboard the College Awareness Bandwagon! WMS is holding a door decorating “college competition” this month. Just find out your TA teacher’s alma mater — that means what college they went to — then decorate your TA door with their college colors, the mascot, and at least 10 fun facts about the school. The Student Services Staff will select the best college booster from each grade — and award Wolf Paws to the entire TA!! Judging begins in ONE week, so get decorating, Wolves! !